The first time the words “Pure Michigan” are believed to have been used in connection with Michigan tourism was at the top of a sheet of lined notebook paper. It was 2006. The worst recession in a generation was a year away, but Michigan’s economy had been struggling for years. State travel leaders were looking for a new strategy to get visitors to come to a place that needed a boost. Mark Lantz scrawled the now-ubiquitous phrase at the top of a page during a meeting with the state’s tourism agency, Travel Michigan. The advertising agency where he worked, McCann Detroit, based in Birmingham, had just been hired to design a new tourism campaign. The state was left cold by McCann’s first pitched slogan — “Find Your True North.” Travel Michigan leaders thought it too heavily favored destinations in the northern part of the state. The group began talking about water, about purity. That’s when Lantz said out loud the words he’d written in his notebook. Bingo. Google “Pure Michigan” today and you’ll get more than 1.5 million results. The brand and commercials show no signs of wearing out, their creators say, unusual for an ad campaign that is more than a decade old. Going forward, Pure Michigan is not going anywhere, state tourism leaders confirmed to Bridge and Crain’s. The brand will live on even as tourism officials face questions about the amount of taxpayer money devoted to the campaign. The slogan is now as synonymous with Michigan as Vernors and Kellogg’s. It’s on license plates, freeway signs, billboards, the dugouts at Detroit’s Comerica Park. There’s a YouTube channel, Twitter, Instagram and Flickr accounts, a sponsored NASCAR race. There’s even a parody website. Still, the tourism industry — like many other industries in Michigan, including its legacy auto sector — says it is trying to adapt to technology-driven changes that are disrupting everything from where vacationers stay to how they plan their trips. That means Pure Michigan has to change, too, said Dave Lorenz, vice president of Travel Michigan, a division of the Michigan Economic Development Corp. That includes efforts to better understand millennial travel preferences and the rise of the sharing economy, as home-sharing service Airbnb disrupts the business model of traditional hotel chains. There’s also more reliance on digital and social media marketing. This fall, Travel Michigan recruited three people to travel scenic routes across the state, with their destinations chosen by visitors to the campaign’s Facebook and Instagram pages. 45: Number of original TV ads produced for the campaign. Lorenz, a self-described fiscal conservative, said he wants to ensure the money spent on the Pure Michigan program is used wisely. Pure Michigan’s $35 million budget (only part of which goes to the Tim Allen ads) is a sliver of the state’s $10 billion general fund. But whether taxpayers get a solid return on Pure Michigan investment has been called into question because the MEDC and the company it hired to evaluate the campaign’s effectiveness refuse to make public how ROI is calculated. The Pure Michigan brand has grown beyond tourism. MEDC staff has adopted it for use in its business attraction marketing. It’s also a commodity, emblazoned on everything from T-shirts to coffee mugs. Lorenz said he thinks Pure Michigan could last for awhile, provided it doesn’t become associated with negative imagery. Concerns about the brand’s viability surfaced during the disastrous drinking water crisis in Flint, as lead-contaminated tap water threatened to tarnish Michigan’s image as home to pristine rivers and lakes. “As long as the brand is not dragged through the mud in some inappropriate fashion, I think it’ll be seen as a positive thing for a long time,” Lorenz said. “Our role when it comes to the brand is to adjust to the times to make sure it always tells the truth, because the essence of successful marketing is telling the truth. Before Pure Michigan, the state’s tourism campaign centered on the slogan “Great Lakes, Great Times,” adopted in the late 1990s under then-Gov. John Engler. It showed visitors the activities Michigan had to offer, but lacked a sense of what it felt like to be in Michigan. Why should Ohioans come to Michigan when there are plenty of places to fish near home? A place surrounded by water. A place undisturbed by the steamroller of “sameness” because it’s not a pass-through state; because it generally requires intention to get here. A place where people can refresh and restore and return to life the way it was meant to be. The formula McCann developed for its TV and radio ads — the theme from the 1999 film, “The Cider House Rules,” panoramic landscapes of lakes and trees, the voice of Detroit-raised actor Tim Allen — capitalized on that sentiment and made Pure Michigan a darling of the industry. Mark Canavan, McCann Detroit’s executive vice president, first realized Pure Michigan’s power when emails began to pour in by the hundreds, from residents and expats alike. Forbes named it one of the 10 best state tourism campaigns in 2009. Travel Michigan and McCann have won numerous awards for the work. Allen has channeled his voiceover gig into serving as an unofficial state champion, extolling Michigan’s Great Lakes beaches as rivals to any East Coast oceanfront. Those close to the campaign in state government, advertising, regional visitors’ bureaus and industry research say Pure Michigan took off because it tapped into a sense of nostalgia at a time when Michiganders were desperate for something that gave them hope. “This campaign not only enhances the state’s image as a place to come and see and enjoy all of the attractions, but also to invest, start a business, to live in, to buy a vacation home, to retire — all of these rather key economic development measures,” said Bill Siegel, founder and CEO of Toronto-based Longwoods International, which Travel Michigan hired to evaluate the Pure Michigan campaign. 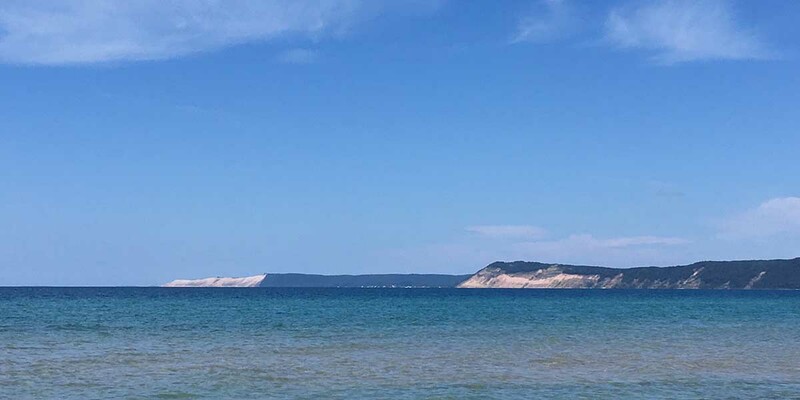 Travel Michigan said the spots are are responsible for millions of trips and more than $1 billion in visitor spending last year, citing Longwoods’ research. Yet it’s impossible to independently assess Longwoods’ numbers, because neither the company nor the state provides public access to how it calculates returns. Siegel would not disclose the specific methodology the company developed, saying it’s proprietary. The Mackinac Center for Public Policy, a Midland-based free market think tank, mailed a postcard it created that crossed out certain words in the text. 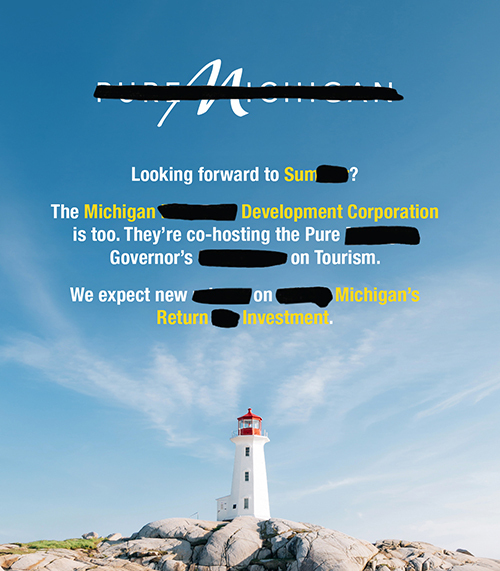 The center said the postcard was intended to highlight what it says is a lack of transparency surrounding the Pure Michigan campaign and a state-commissioned study of its return on investment during Sunshine Week in March. Nor would taxpayer-supported Travel Michigan provide direct access to how Longwoods calculated return on investment. The agency said in an email that Longwoods researchers asked visitors if they saw a Pure Michigan campaign spot and whether it prompted their trip, and also asked them to compare Michigan to other states. Michigan tourism officials say Longwoods controlled for “internal and external factors,” but will not say which factors were considered. By Longwoods’ analysis, the $12.9 million invested in Pure Michigan advertising in 2016 yielded $107.3 million in new state tax revenue — a return of $8.33 for every dollar spent. The Mackinac Center for Public Policy, a Midland-based, free-market think tank, has been an outspoken critic of Travel Michigan, and specifically Longwoods, for its ROI findings. The state last month parted ways with Longwoods, a decision Lorenz said was more about gaining new insights on how to direct the campaign in the future and less because of the ROI criticism. Travel Michigan plans to sign a three-year deal worth $92,500 per year, or $277,500, with Indianapolis-based Strategic Marketing and Research Insights. The Mackinac Center contends the figures are too high to be believed, but it says it can’t know by how much, since the company doesn’t disclose its methodology. Mackinac also claims the MEDC has a conflict of interest in seeking ROI figures because it manages the program being studied and would have a reason to seek positive numbers. The Mackinac Center released a report in 2016 using its own statistical tool to calculate Pure Michigan’s ROI, looking at the impact of tourist spending on hotels and accommodations, arts and entertainment and amusement and recreation. Mackinac’s results showed little impact on the individual industry sectors and a negative net return on investment. Lorenz characterized the Mackinac Center’s criticism as political, noting that it had opposed MEDC tax incentive programs in the past. He also suggested that ROI isn’t terribly important to him. “People always focus on the (ROI) numbers. I never have,” he said. Lorenz said it’s the insights gleaned from the research that he finds more important, such as learning that Michigan is highly regarded for its nature and urban experiences but not so much for arts and culture. He said the numbers are estimates, since there is no accurate way to track every visitor, what brought them to Michigan, or their spending habits. But Lorenz said the size of Longwoods’ sampling — of 4,000 travelers from the Midwest and nationally — offers a “scorecard” to measure how well the brand is recognized outside of Michigan. Ninety-eight percent “of people who look at things in a fair manner will look at what we do and say it’s really making an impact,” he said. David Reibstein, a marketing professor at The Wharton School at the University of Pennsylvania, said the purest way to measure the impact of tourism marketing would be to run the campaign in one market and not in another to control for exposure and to see if tourist activity increases. The state could also track visitors as a campaign is rolled out nationally to new markets, said Reibstein, who is not familiar with the Pure Michigan campaign. One challenge is controlling for prospective travelers in midwest states who may be more likely to visit Michigan anyway. Still, Reibstein said, organizations would be “irresponsible” if they didn’t attempt to quantify ROI on public spending programs. The Mackinac Center argues that if lawmakers won’t cut funding to Pure Michigan, they should at least have an independent state agency conduct an audit of its performance and consider the opportunity costs, or tradeoffs, that come with diverting tax dollars to tourism promotion. Industry partners, including visitors’ bureaus across the state, should fund Pure Michigan advertising, said LaFaive of Mackinac, rather than relying on taxpayers. Not true, say tourism directors from Detroit and Grand Rapids. They say regional visitors’ bureaus have limited budgets that stretch farther with state dollars, because the MEDC matches their contributions toward their own locally focused commercial. Small said the Mackinac Center’s ROI study looked at three industry sectors, while other industry research includes as many as nine to evaluate impact. Lorenz said Travel Michigan has begun to experiment with the structure that made it famous. Its Detroit ad, for instance, is faster-paced and uses slightly different theme music. McCann also has shifted to Pure Michigan ads more focused on passion travel, highlighting Michigan’s foodie culture and craft beer scene, rather than sticking to a certain geography. Canavan, McCann Detroit’s executive creative director, said at some point the group wants to update its winter advertising. He said marketing for passions and interests, rather than places will be more important. So will the role of social and digital media. Small, of the Grand Rapids visitors’ bureau, said he and his team ask how long the campaign could be sustained when they talk about budgeting money toward it. At some point, he said, the state will have to make a run at something new — especially if TV declines as a medium compared with other digital tools. “It is really weird in the ad business to say, ‘We’re going to try to create a campaign that will last for a generation or more,’ but I can tell you honestly when we were working on this — before we shared it with anyone — that was very much on our mind,” Lantz said. I am a lifelong Detroiter, and my sister (a former Detroiter now living in North Carolina) visits annually and we make a point of visiting someplace new in Michigan. We have been to Grand Rapids twice (love Meijer Gardens and the art and history museums), Saugatuck (great food, great art and shopping), Suttons Bay (beautiful with wine and cherries to boot), Sault St. Marie in the UP (went through the locks - amazing) and this summer Alpena (lovely town, loved the Marine Sanctuary and shipwreck glass bottom boat tour). I always use the Pure Michigan website to get information on destinations, local sttractions, restaurants, hotels and motels, etc. It's not just out-of-staters who use this, but some of us here in the state are using it to take advantage of the wonderful things Michigan has to offer outside of our own hometown. Next year we're thinking Bay City! The Pure Michigan ads through out the country has brought raves from our friends from several states. I volunteer at the Traverse City Visitor's Center and it is amazing how many people are here because of the ads. Perhaps the true ROI is somewhere in the middle? To suggest this hasn't been a home run ad campaign in my mind says you don't believe advertising has value. I have seen that stance taken frequently by some in leadership during my career in marketing and business development. Its been my experience people with this viewpoint just won't accept the potential impact of the value of advertising, strong branding and marketing. In spite of the proof of decades of product/service success created by just such messaging. Friends from several states speak highly of the Pure Michigan ads and spurs some to visit Michigan for the first time. I volunteer at the Traverse City Visitors Center and am amazed at how many people from all the other states are here as the result of the Pure Michigan TV ads. "Yet it’s impossible to independently assess Longwoods’ numbers, because neither the company nor the state provides public access to how it calculates returns. Siegel would not disclose the specific methodology the company developed, saying it’s proprietary." I'm surprised that for a governor who is big on "dashboards" and metrics, and a republican party that is purportedly big on accountability, there isn't more attention being paid to this. Follow the money (PAC donations) perhaps? No question that Pure Michigan has been a great success, but it would contribute even more to Michigan's long term success if the Michigan government used the values expressed in the Pure Michigan ads as goals when they consider legislation and rule creation, i.e. "Do our actions support the Pure Michigan ideal?" They can start with rejecting House Bill 4205 that would limit Michigan's environmental protections to be no more protective that those set by the US government. A serious concern given Trump's nominee Dourson to head EPA's toxics office. 1. I was in Chicago when the first Pure Michigan ads appeared on buses. I literally swelled with pride in my much loved, national punchline of a state. That is no small part of Pure Michigan's value. 2. As usual, the Mackinac Center misses the point, and drives home the reverse. Even without all the details, I know what their edited postcard says. We don't always need to see all the details to draw good conclusions. 3. That said, while I assume the methodology is proprietary, and the consultant doesn't want to give away trade secrets, there should be some level of transparency around methodology. I wouldn't accept 'trust me' as an answer from my vendor, and there must be a way to answer questions without disclosure of the secret sauce.